Wearing matching dresses before the world was big. It’s a memory of friendship, of safety, of a feeling of confidence, but it’s brief. The big change starts weighing again, her mind becomes like a firetruck screaming down the street. She has time for a quick shout-out to her Mom and Dad, part of what she’s leaving behind, then tries to return to her calming memory. This time the vocals, flypaper tight until now, unpeel from each other and sing the lines independently, over each other: a perfect aural conjuring of inevitable separation. Ten years from now, with another life transition in front of her, a marriage or move or money crisis or baby, she’ll no doubt remember this moment leaving for college as the time before the world was big. And ten years from then at 40 as death and divorce start figuring out her address perhaps she’ll take refuge in a memory of sitting on the couch in the middle of night nursing her newborn, a moment of safety and confidence before the world was big. All of which to say, does the world ever get small? No, and mystical Van Morrison types would tell us it shouldn’t, and we should hold tight to our sense of wonder. What’s the difference between a sense of wonder and a constant feeling that there’s always going to be bigger and bigger stuff you don’t understand and can’t rise above, a constant fear of something worse coming down the line? It can be frustrating, this suspicion you get the hang of it only in the past tense. Ah, maybe I’m just in a bad mood. Cute song, anyway. 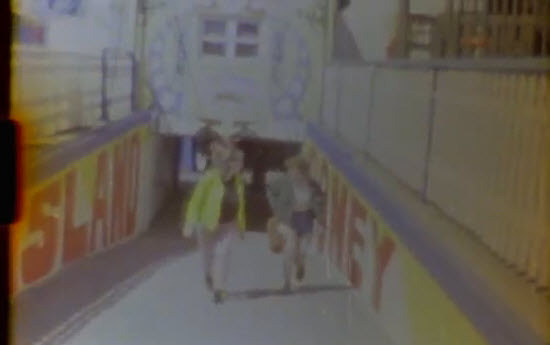 The video is cute, too, two young girls cavorting in Coney Island in sepia tones. They do seem utterly, completely happy.